RISEN is a new movie that follows the epic Biblical story of the Resurrection, as told through the eyes of a non-believer. Clavius, a powerful Roman Military Tribune, and his aide Lucius, are tasked with solving the mystery of what happened to Jesus in the weeks following the crucifixion, in order to disprove the rumors of a risen Messiah and prevent an uprising in Jerusalem. 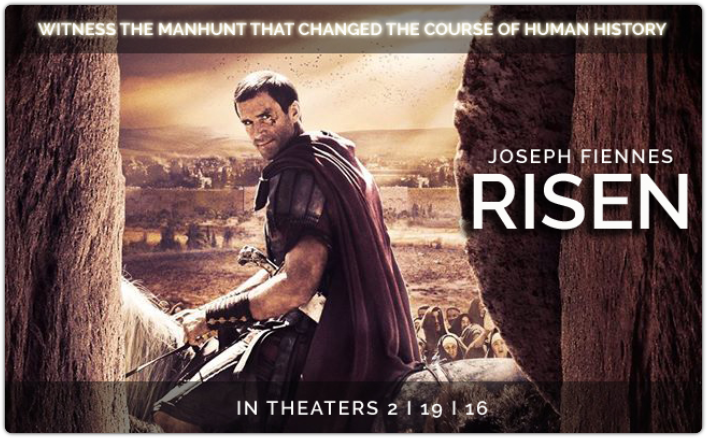 Click Here for more information and additional media assets you can use for promoting RISEN! Plan a Sermon Series leading up to the release of RISEN on February 19, 2016 . Follow up with a church family movie night out. ​​Offer four tickets for the price of two to encourage your couples to go on double dates with their unchurched friends. Encourage your high school and college students to enjoy a group outing followed by a discussion about the truth and meaning of the resurrection. Engage your church to begin promoting RISEN and use it as an opportunity to share the true meaning of Easter.